Since changing my diet a little, and trying to eliminate dairy, I’ve been missing cheese like crazy! My attempts to go fully vegan failed many times before, and cheese is mainly to blame. I found it incredibly hard to quit this smelly, salty and creamy things. You would think that because it is smelly and salty it will be easy to forget about it, but I guess I’ve always been attracted to weird things and this is no exception. Thankfully there are cashews and nutritional yeast!!! I will never stop being amazed by cashews and how many things you can turn them into. Small nut, but oh, how powerful! Funny enough, until incorporating more of vegan diet, I didn’t even know that nuts could be used for anything else than a topping for cookies or chocolate! Yup, I was a nut virgin in a way…NOT ANYMORE!!! 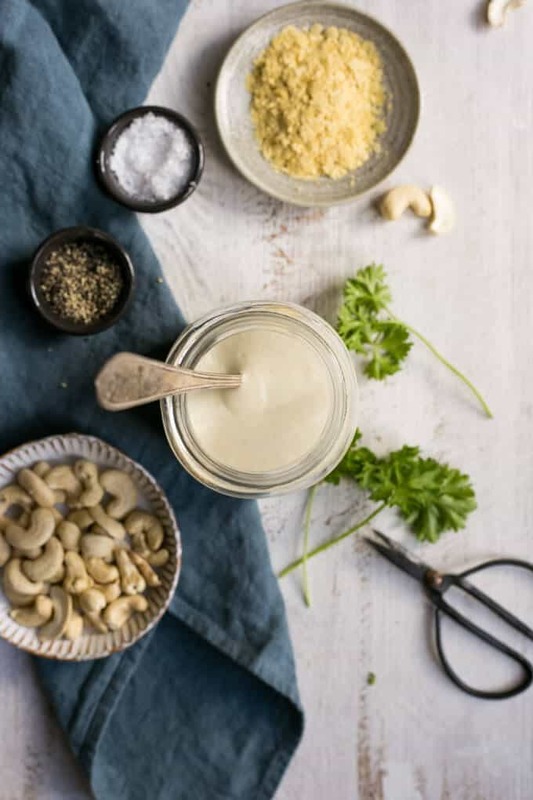 Cashew cheese sauce is also great for pizza’s or savory snacks like tarts and muffins. Or even as a dip on some chips, crisps or veggies. Actually, I could eat it on pretty much anything. But the area where it really takes it to the next level and will blew your cotton socks away, is with pasta. 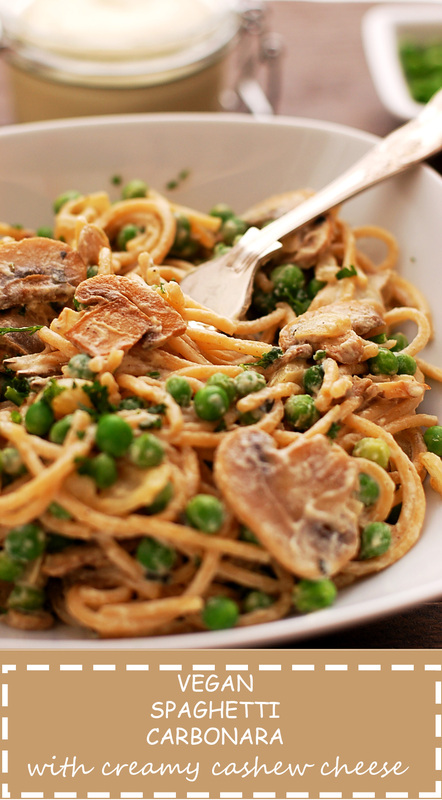 It’s a great base for any creamy sauce, and I happen to fancy some Carbonara, so here we are. 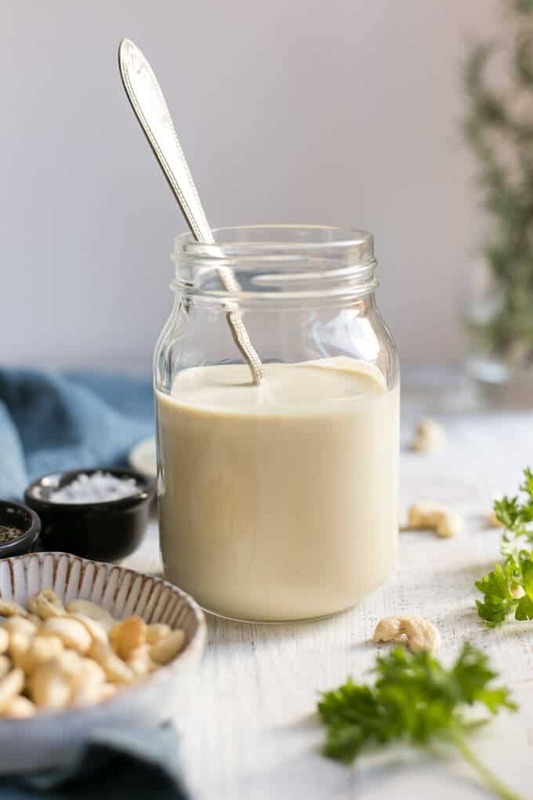 The preparation and cooking times for this recipe is not including soaking cashews, and I would recommend you to soak them overnight. Some recipes suggest that 3-4 hours will be enough, but I found that texture is not as smooth and creamy as when leaving them in water over night. It tastes good, but it’s not the same (just like in that advert!). Also, you can store it in your fridge for 3-4 days, so get ready for some cheesy moments! If you are cashew cheese virgin, you must try this. There will be no disappointment, I can guarantee you!!! Now, enough talking, say ‘cheese’, and carb up!!! 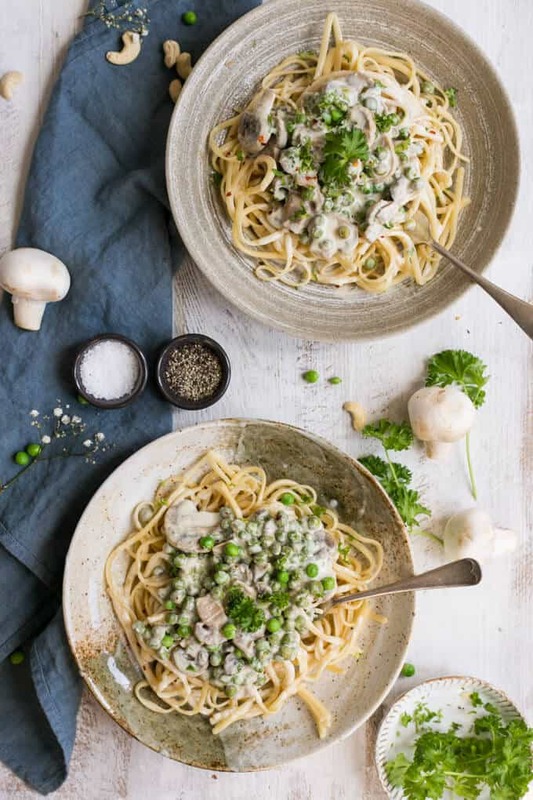 Super yummy, vegan spaghetti Carbonara with creamy cashew cheese sauce. Easy, quick recipe for dinner! Rinse your cashews and place in blender along with the rest of ingredients. Blend until you have smooth, creamy texture and set aside. Cook your pasta as per package instructions, cool down and drizzle with olive oil, set aside. Heat up medium frying pan and add 1-2 tbsp. olive oil. Add garlic and stir fry for a minute. Add onion and mushrooms and stir fry until golden brown (about 5 mins). Add fresh or frozen peas and cook further for 3 mins, stir in 4 tbsp. of cashew cheese and mix until well combined. Serve immediately, sprinkle with fresh parsley. 742 for 1 serving or for 3 😮 ??! 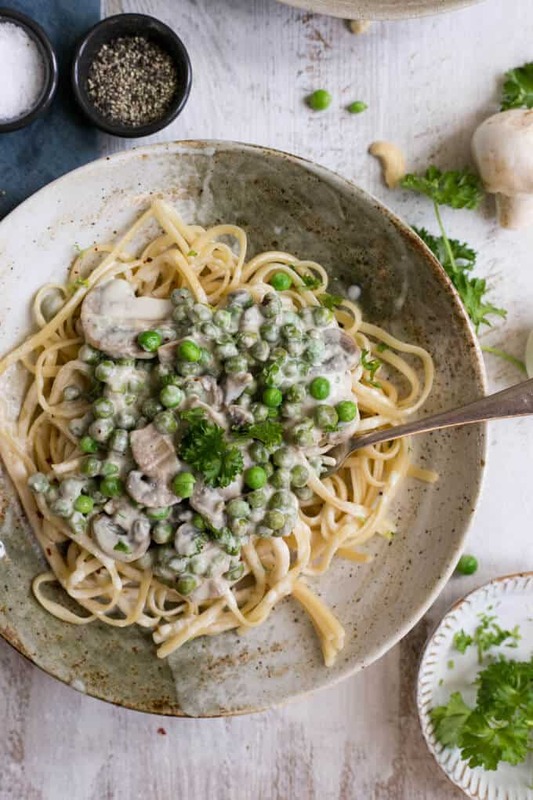 This is the tastiest vegan carbonara I’ve ever tried! That cashew cream/ sauce is just delicious! Great recipe that I will definitely make again and again! Thank you. So glad to hear you’ve enjoyed the recipe! It’s one of my absolute favorites too, and it’s so simple! Thank you for your feedback! I’m so glad I found this on Pinterest. 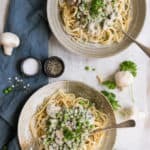 The best vegan carbonara I’ve tried to date! Thanks so much, I’m so happy to hear that! Really pleased you liked it! That is absolutely fantastic to hear!!! I love when you can’t even tell when food is vegan, and to hear that even meat- eaters enjoyed my carbonara- it’s like a music to my ears!!! Thanks so much for this lovely comment! I cannot thank you enough for this recipe! I’ve been doing veganuary this month and tried this couple of weeks ago. I’ve made it 3 times since then, and each time is a success! Delicious and easy recipe perfect for any day! That is such a great thing to hear! I’m over the moon to hear you’ve tried it and liked it so much! Hope veganuary is going well and that you will be coming back to this recipe! Found this on Pinterest, and I’m so glad I did! It’s a delicious recipe that works! The creamy sauce is to die for! Thanks for this great review! You’ve made my day! What can I substitute brad crumbs with? I don’t have bread crumbs. there are no breadcrumbs in this recipe? Thank you for this lovely recipe! My kids loved it! Hi Dee, thanks so much for your comment and rating! I’m over the moon to hear that your family loved this recipe!